Located in the South Lake Union, North Belltown area of Seattle, husband and wife duo, Rich Powell and Karrie Stewart were inspired by the beauty and functionality of the TeKu Glass and aim to elevate the beer scene in Seattle. They have taken their love of beer and high quality standards to create a space for the ultimate experience in beer tasting, shopping, and sharing. TeKu Tavern prides itself on being knowledgeable proprietors of beer; ensuring proper storage, care, and presentation so it can be enjoyed as intended by the product's creators. TeKu Tavern offers 50 taps and seating for up to 180. Guests can shop the 23 fridges of products to find just the right beer to take home or enjoy on-site, at any of the long, communal beer hall tables. The beer menu is organized by flavor profiles, rather than style to help easily guide consumers along to flavors they already enjoy or to those that wish to explore for the first time. 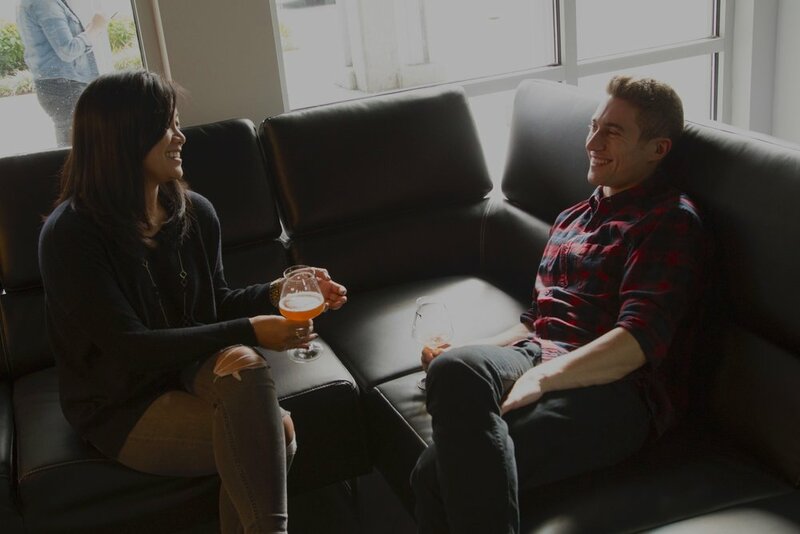 Whether you’re a novice or veteran beer drinker, TeKu Tavern strives to be a place to experience great quality beer from around the world and to educate consumers on all the great things about beer. You know what pairs well with great beer? Games! We also have an expansive and ever-growing game library full of a variety of board games for you to borrow or purchase. We foster a strong community of craft beer drinkers and gamers looking for a 21+ environment to enjoy a variety of games including tabletop board games, Dungeons and Dragons, and Magic the Gathering. We are in fact the only 21+ establishment to carry Wizards of the Coast products! Located between South Lake Union and Belltown, TeKu Tavern is changing the scene for Seattle beer lovers. TeKu Tavern is a bottle shop and taproom specializing in the sale and presentation of well-crafted beer. Inspired by the TeKu, a beer glass designed to be both elegant and functional serving as an industry standard for sensory evaluation, TeKu Tavern seeks to bring you the very best beer experience. Whether you're looking for a place to hang out for happy hour or an exotic beer to enjoy at home, TeKu Tavern has what you need. Our knowledgeable staff will help you navigate our 50 draft lines and extensive bottle list to find the right beer for you. Karrie, a former Flight Test Engineer for Boeing, and husband Rich, a Product Manager for Amazon, developed their own passion and high standard for beer quality through years of exploration and beer-specific educational events from coast to coast and internationally. Both are Cicerone certified beer servers and Rich has received his Associates in Brewing Technology from the Siebel Institute in Brewing Technology. The beer-centric couple share a passion for quality and educating others, because that’s how they fell in love with craft beer. They’re taking this to the next level in creating a place where everyone can learn something new about the art of beer while enjoying one and sharing the experience with others. TAVERN DOG & OFFICIAL GREATER! Kona is the resident Tavern Dog! She enjoys chasing her toys and doing tricks for treats (especially pretzels). She lives a Ruff life hanging out at TeKu Tavern everyday, where she gives love and affection while convincing customers to give her treats! My wife and I moved to Seattle this year from Southern California, where we both grew up. After years of working as a professional musician and a general manager for a instrument retailer/repair shop I jumped ship and joined the beer industry here. I have had an obsession with craft beer since college and generally my tastes lean towards the sour beer world. I initially worked for Elysian Brewing but have found a happy home at TeKu Tavern. When I am not at work I can either be found brewing beer with my cats or playing music. I can also frequently be found being mistaken for Zach Galifianakis for some reason. I always realize my favorite brews are tied to the company or venue just as much as unrivaled flavor. This is because I was pulled into the craft beer world through sharing bottles with friends. My passion for beer is driven by curiosity. With new breweries popping up everyday, there is always another bottle to open with great company. Originally born in Rhode Island, I grew up on Bainbridge Island. After attending high school in San Francisco, I made my way out to Colorado, where I studied neuroscience and music while developing a love for craft beer. After graduating, I explored the California wine world while bartending at Wine Down in San Francisco before returning home to the PNW and finding a beer-happy home at Teku Tavern. My favorite food is cheese. Cam grew up in Waterbury, VT in a family of adventurous cooks who instilled in him a passion for all things “craft”. After receiving a degree in biology from Whitman College, and frequently homebrewing during his time there, he moved to Seattle to dive in to the beer industry. He started as a cellarman at Stoup Brewing and later helped to redevelop the laboratory program there. He currently manages the lab part time and relishes the opportunity to serve the beer drinkers of Seattle while at Teku. When not in the beer world Cam can be found playing drums with his band, The Whags, or gardening. Reared in the Puget Sound area Dan fostered a keen interest in well-crafted beverages at university while purportedly studying English. After living abroad in exotic Tunisia and Texas, he returned to his homeland and split time between non-profit day jobbery and other interests including an opportunity to work for a Woodinville winemaker. Having abandoned a desk as one abandons an undrunk amber on an August afternoon, Dan now pursues his enthusiasm for sometimes making, avidly testing and forever preaching the good word of fine fermented refreshments to all who would listen. Sigmund (or Sig, if you're feeling folksy) grew an appreciation for beer while toiling away in his hometown brewery as a young whippersnapper. After attending college in Boulder, Colorado, his love for all things fermented grew strong and hearty like a healthy sourdough starter. This passionate entanglement with fine ales came to a head while working as a beer writer here in glorious Seattle, and he hasn't looked back since. When not tasting beer or balancing it on his head, you can find him getting stumped at crossword puzzles or exploring the majestic Pacific Northwest. He couldn't be more thrilled to share his love for the greatest beverage on earth to the first-rate patrons of TeKu Tavern. TeKu is the name of a beer glass designed by Teo Musso of Baladin Brewery in Torino, Italy and sensory expert Lorenzo Dabove (working under the alias 'Kuaska'). The name of the glass is an amalgamation of its creators names, 'Teo' and 'Kuaska'. Inspired by the ISO glass used by the wine industry, Musso wanted to create a glass that could serve as an industry standard for the sensory experience of beer. Recognizing the effect that size and shape of a vessel have on the drinker's perception, he created several prototypes and teamed with Kuaska to evaluate them. The resulting creation, the TeKu glass, is both beautiful and functional. CAN I ENJOY A BEER WHILE AT TEKU? WHAT ABOUT BOTTLES/CANS TO GO? Yes; at TeKu Tavern you can enjoy an amazing craft beer, cider, or mead on draft. We support up to 50 taps through our custom built draft system. In addition, the space flows to table seating, and our retail selection, supporting up to 140 people at any given time. Our retail section is made up of 23 fridge sections, supporting those same taste formats: beer, cider, sake, mead, and even a small N/A (non-alcoholic) selection. As a tavern, we have the ability to present tastes to go, from our retail selections, and you can also choose to enjoy a bottle, or can, on site, delivered through industry standard corkage. DO YOU FILL GROWLERS? WHAT ABOUT CROWLERS? Most taps will be available for growler fills. A crowler system will be added in the near future. We also sell 32`oz and 64`oz growlers in the shop (which come with a discount on your first growler fill). Yes! We serve a small selection of snacks including Meat and Cheese packs, Adult lunchables, crackers, chips, landjaeger, and a few other items. We also welcome patrons to bring food in from our many neighboring restaurants. Food can be a pivotal part of a great beer experience. Ask your bartender for a recommendation for a beer that either complements or contrasts your particular dish. TeKu Tavern is 21+. We are considered a Tavern under the WA State Liquor Control Board, which restricts us to only allowing patrons over the age of 21. DO YOU SHOW SEAHAWKS GAMES? WHAT ABOUT SOUNDERS AND COLLEGE FOOTBALL? Yes, Seahawks games will be played on a pull down projector screen and adjacent TVs in the Beer hall. We open at 10am on Sundays for early game viewing. We will also be opening early on Saturday’s for College Football viewing. The following schools will have priority for viewing: Georgia Tech, Purdue, UW: Huskies, & Michigan. Sounders / Mariners games will also be showcased on the projector. Yes! Email info@tekutavern.beer for table reservations. Reservations are available most days of the week, except when major events are going on. We also DON’T tale reservations from 5pm onwards on Fridays. To reserve a Beer Hall table you must have a group of 7 or more. CAN I RENT OUT PART OF TEKU TAVERN FOR A GROUP? Yes, contact us for booking tables, the full beer hall, or entire shop for events. WHERE CAN I PURCHASE A TEKU GLASS OR OTHER MERCHANDISE? TeKu glasses and other merchandise can be purchased at TeKu Tavern or via our online shop. ARE ALL BEERS SERVED IN A TEKU GLASS? No, beers will be served in the appropriate glassware to accentuate the appropriate color, aroma, and flavors of the particular beer. About half of the beers will be served in the TeKu glass, or upon request. HOW DO I FIND OUT WHAT EVENTS AND SPECIALS ARE HAPPENING AT TEKU TAVERN? On our Calendar, or by signing up for our newsletter at the bottom of this page. Cash, Credit/Debit Cards [Mastercard, Visa, Discover, American Express]. Street parking exists on Taylor Ave, adjacent to the business, along with other side streets North and West of TeKu Tavern. There is also a U-Park parking lot directly across the street, at the intersection of Denny Way, Taylor, Vine St. I WANT TO WORK AT TEKU TAVERN, HOW DO I APPLY? DOES TEKU TAVERN HAVE ANY GAMES OR OTHER THINGS TO DO WHEN WE VISIT? Yes! We are all game nerds as well as beer nerds. We have a large board game library for you to borrow from, including classics like Codenames, Dominion, and Cards Against Humanity. We welcome all kinds of games to be played on our tables be it Dungeons and Dragons, Magic the Gathering, or any other table top games! Yes! We sell all of the board games we carry as well as Dungeons and Dragons product and Magic the Gathering! We are in fact the only 21+ establishment to carry D&D or Magic! CAN MY DUNGEONS AND DRAGONS GROUP OR OTHER GAMING GROUP USE YOUR TABLES? Nothing goes better than beer and games, we welcome any gaming groups looking for refreshments as they battle through any dungeons! DO YOU EVER HAVE GAME NIGHTS OR GAME EVENTS? We host Dungeons and Dragons nights as part of our brewers nights regularly as well as casual Magic the Gathering events.